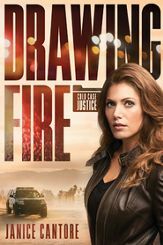 Drawing Fire is Book One in the Cold Case Justice Series by Janice Cantore and the first of Ms. Cantore’s books that I’ve read. I’m excited for the second book in the series and have added her other books to my To Be Read pile! This book was a fast and exciting read for me. I loved the action, mystery and intrigue woven throughout the story. Abby Hart is a good homicide detective and her motivation to find her parent’s killers has kept her going. Nicknamed “Superglue”, she is known for being thorough and not letting a case go until it’s solved. Luke Murphy is a private investigator who finds himself caught up in Abby’s world by an unknown previous connection. Together, they make a dynamic team with their combined case files and desire for justice. I loved the storyline in this book. It was a suspenseful read that had me enthralled by page one. I received the Advanced Reader Copy of this book from Edelweiss and Tyndale Publishers in exchange for my honest review which I’ve provided here.